Was it just me or did March crawl by? I suppose after February any month seems like a century. In any case, I’m thrilled it’s spring and I intend to bask in the sun on every patio in Portland from now until September. March was another busy and productive month for us with lots of new content, blogger resources and a little travel. 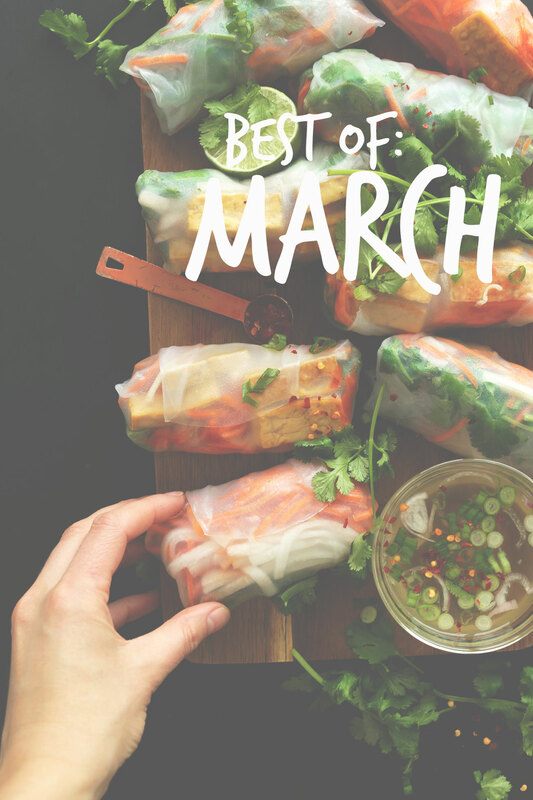 Today we’re recapping everything we did, ate and made this month, starting with eats! In March we added an Artificial Lighting Course to our Food Photography School! In 7 videos I teach, explain and demonstrate how to utilize artificial light for natural looking photos. Current members received this course for FREE! Any additional videos added in the future are also included in the one-time membership fee. Don’t miss out! We also added an Artificial Lighting Equipment Recommendations article to our Blogger Resources page. For those looking to dabble into the world of artificial light, this page would be a great place to start. Lastly, we updated our 31 Meals Cookbook to include nutritional information for every recipe! Check out the information page for a detailed list of what the cookbook includes, as well as what customers are saying! Celebrated our 5th wedding anniversary in true John and Dana style – take out and movies. Traveled to Kansas for some freelance food styling work and to visit family. Made some serious progress on our print cookbook (due out later this year)! Follow us on Instagram for all of the behind-the-scenes action. We’ll also be rounding up taste testers soon, so stay tuned! Sorry but also not sorry. 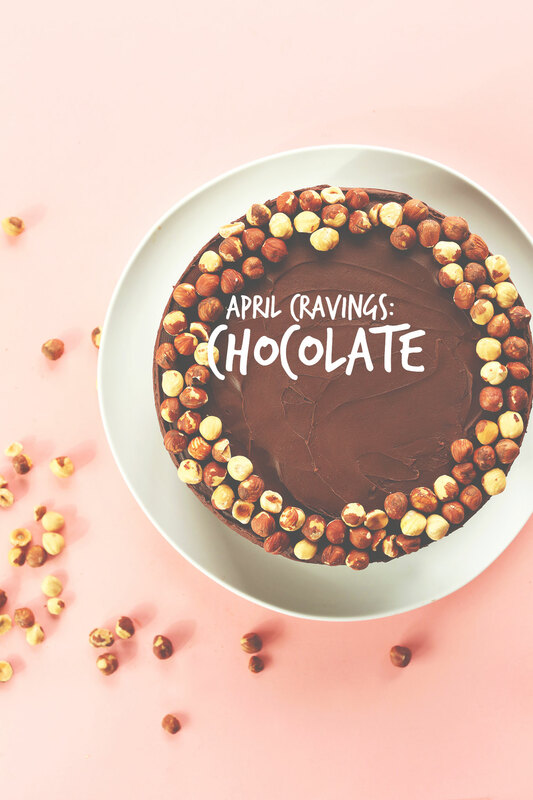 It’s all about the chocolate in April. Be stoked! See you back soon for a new recipe. Cheer, friends! April = Chocolate?! Best news EVER. A book?? WOW!!! I can’t wait to pre-order it!!! All these recipes look amazing… That hazelnut chocolate delight that you have in store for April I almost stuck my teeth on my computer screen!!.. Thanks Dana! haha yay! We’ll have more info on the preorder soon! Wow lots of amazing recipes this month! They all sound so yummy. I’ve been doing an end of the month post with recommendations, updates and links I like. The recap of recipes is a great idea. In case your readers miss some. Is funny how you said March just crawled by because that’s exactly how it feels! I am just excited for the nice weather (fingers crossed) so I can start running outside again. That first day of warm spring weather where you can run outside in shorts is THE best. Hope it comes soon for you! I probably couldn’t count the number of seedy granola bars I’ve eaten or quantify how badly I want to make some more coffee coconut ice cream. You’re making my flirting with veganism easy and TASTY!!! haha, yay! So glad we can provide such tantalizing recipes! That is one amazing month! You guys have such a great thing going here. I love what you do! I absolutely LOVE your site! I’ve made and continue to make weekly batches of so many of your recipes. Today I’m trying the spring rolls..last night it was a batch of sweet potato and black bean veggie burgers? I love that the recipes are easy to follow with minimal ingredients. Thank you..Thank you.. Thank you for helping me to lead a flavorful and healthy lifestyle! So great to hear! Thanks for saying hi, Lisa. So great to know the recipes are serving you and your family well! Holy moley. I’m thinking about making the no-bake chocolate cheesecake for Easter. Not to mention those Snickers Bars. Those look absolutely marvelous. Anyhow, March was the month I was supposed to clean my garage! The 6 year old girl next door told me it was trashed. That’s just embarrassing. True, but embarrassing.